Halloween and fireworks are upon us already – where is this year skipping off to in such a hurry, dear Reader? We’ve had weeks of watching the village next door preparing for the annual Bonfire and fireworks’ night, wood piling up and strange straw-stuffed people cropping up all over the place. Primrose and I are always caught unawares by the extremely creepy looking ‘guys’ which pop up round the village this time of year. One in particular terrified the life out of me in the dark the other night, causing me to slam on the brakes and utter some rather unrepeatable words. It was a policeman with a speed gun. Not very funny when you’ve already done the speed awareness course….. Both Primrose and I were convinced from a distance that he was a real policeman. Poppy will no doubt be uttering the choice words I used to vent my anger for weeks, most likely during the intercessions in church and there’s nothing like getting an earful from a six year old as to why you ought to obey speed limits either. Stupid thing was that after all that unnecessary drama, I was actually doing the speed limit! Guilty conscience, dear Reader, guilty conscience. 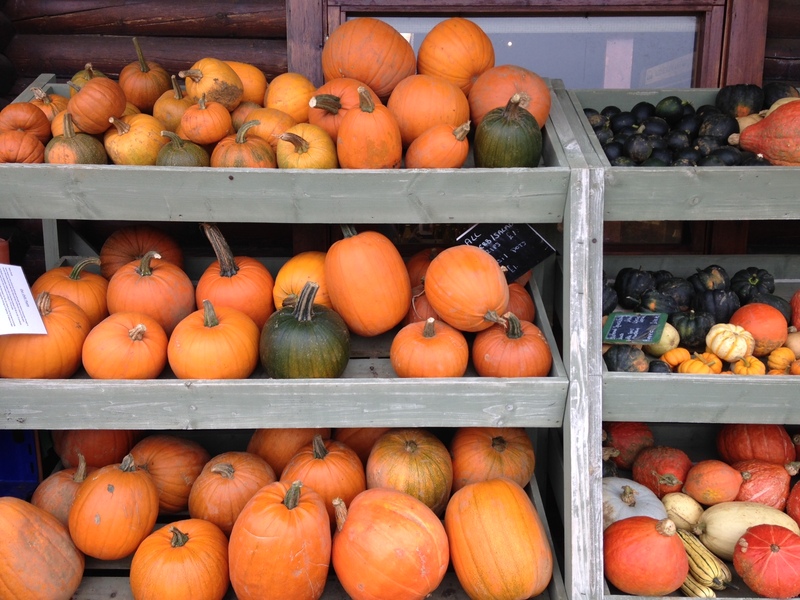 With the witching hour in our sights, Primrose, Poppy and I set to work on creating a little pumpkin magic of our own. 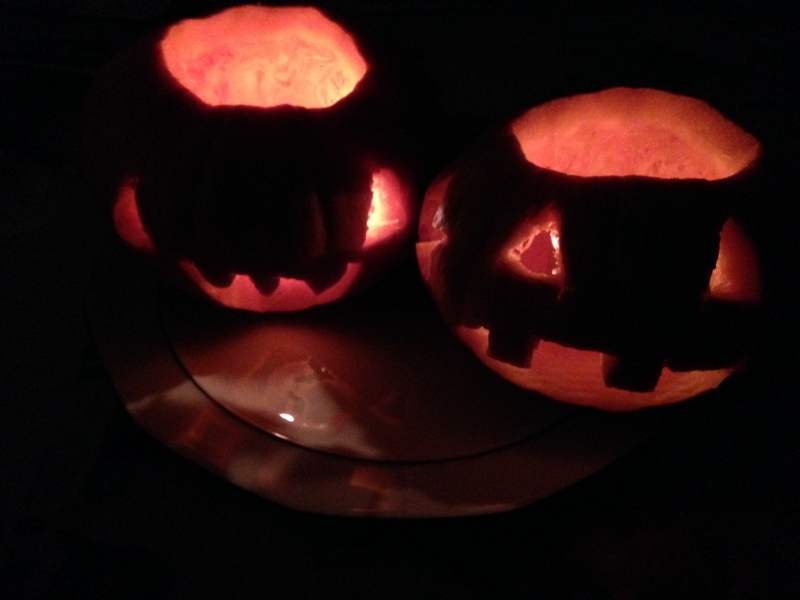 Last year when we carved pumpkins, we lost power in the village due to high winds and the pumpkins had to be adopted as an emergency light source to guiding Jerry to the front door on his way home from work! I am keeping everything crossed that this year, we can simply enjoy their orangey glow in the kitchen instead. You can’t beat a good bonfire in my opinion, dear Reader. There’s something so wonderfully primeval about gathering round a big fire. The perfect excuse for a few gins and a bit of village gossip before the whizzy bangs of the amazing fireworks. 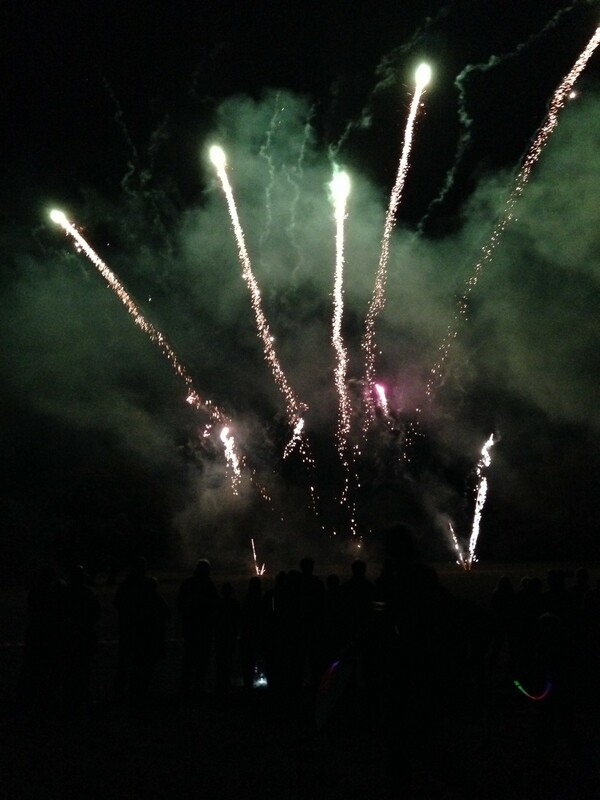 Only we could have a farmer in the village who has a sideline specialising in professional fireworks displays – simply brilliant. We oohed and aahed at all the glittery, spinning, colourful pops until Poppy and Primrose decided that it was far too loud and Jerry and I got arm ache holding our hands over their ears. Thankfully we just about managed to last out until the end. 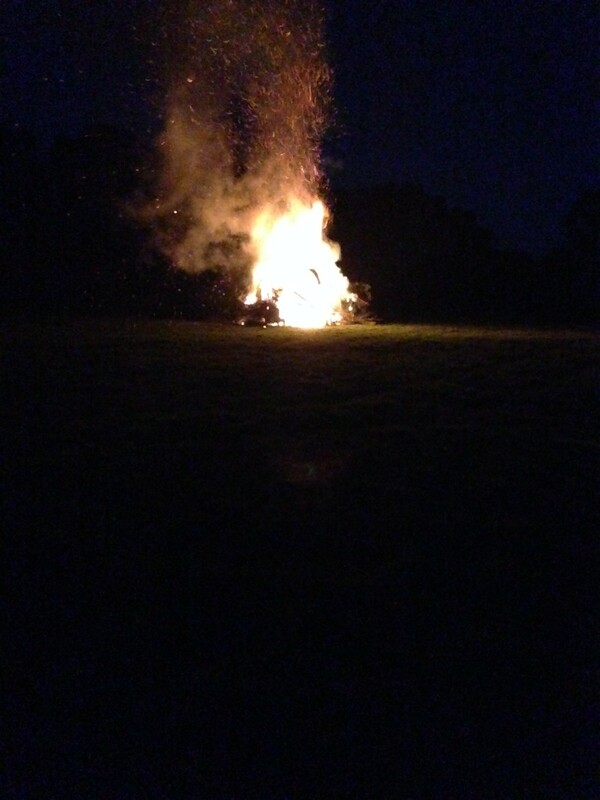 The bonfire was a real roarer and I could have stayed on mesmerised – must remember to pack a hipflask next year and not feed the children marshmallows dipped in chocolate for tea. Bedtime was predictably a nightmare – epically long in fact when you can’t wait to get back to a large g&t. As if in salute to this time of year, more autumnal loveliness found its way into the cottage this week too with a wonderful little larder find in the form of a jar of Chazwinkle’s. What could be better than coming home to a satisfying Bonfire night supper? Thank goodness for my little champion in the kitchen. Where would I be without my Everhot?! Good comfort food should always come in the form of a creamy Tartiflette. I can’t claim to have anything vastly different from anyone else’s recipe but it’s the kind of dish that spells a huge calorific hug from autumn in our home and it can be left to cook, whilst out enjoying the fireworks. So here is my recipe for this week – a perfect match for Bonfire night and a good spoonful of earthy Beetroot Chazwinkle’s. Begin by using a mandolin to finely slice the potatoes. Leave the sliced potatoes to one side. Add the bacon, onion and garlic to a frying pan with a little olive oil and fry until the bacon is crisp and the onion and garlic are soft. Deglaze the pan with the white wine and allow to bubble down for a few seconds. Start layering up the ingredients in an ovenware dish, adding a spoonful of the bacon mixture to the bottom of an ovenware dish (using a slotted spoon to separate from the liquid), followed by a layer of the sliced potatoes. Add a handful of the Reblochon and repeat until you’ve reached the top of the dish, finishing with a layer of potatoes on top. Season the top layer with a little salt and pepper and a little grating of nutmeg. Pour over the double cream and wine from the frying pan. Bake in a hot oven (200 degrees Centigrade or so) until the potatoes are soft (test by poking through the middle with a knife), the top is crisp and the underside unctuous and creamy. 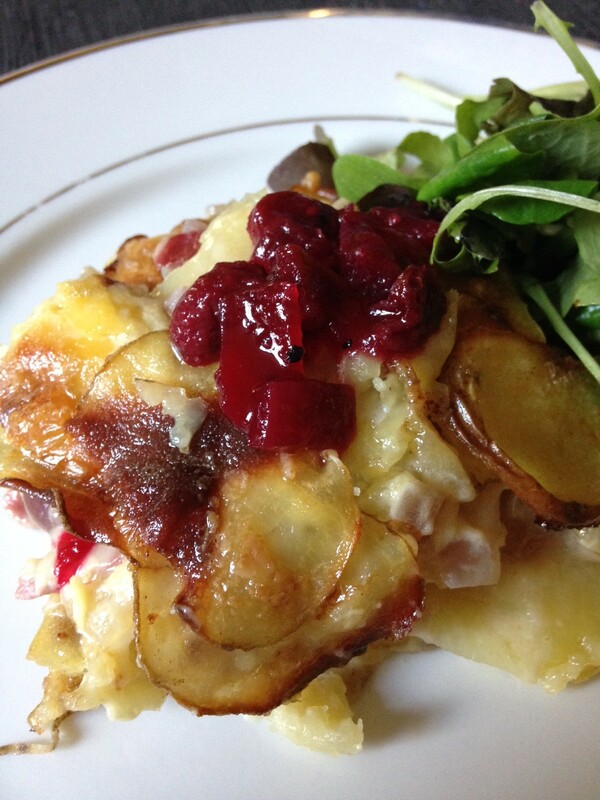 Serve with a good spoonful of Beetroot Chazwinkle’s and a handful of winter leaves. I really must get round to some pickling and preserving, or should I say Chazwinkling, myself! That jar of deliciousness has found its way into everything this week from filo parcels to Jerry’s favourite, game pie, and it’s almost all gone! Loved the article, particularly your ‘brush with the law’ and the recipe, comfort food at its best! I often wonder about the straw stuffed effigies in the village and whether we harbour a pagan side! Very Wicker Man I think. Blooming policeman! that sounds totally delicious! Only wish I had an ever hot to myself! Enjoy the fireworks. It is delicious! True comfort food.